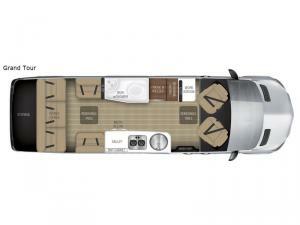 This Grand Tour Special Edition Tommy Bahama Relax Edition Interstate class B diesel touring coach features seat belts for 7, and all the amenities you need to take off to find paradise. You will also enjoy a bit of added storage in the very rear of the coach, as well as, removable tables which provides extra space for moving around. The power lounge can be used for a seating area during the day or transform into an extra sleeping space at night. One way this motor home utilizes its space is by having a wet bath with shower.